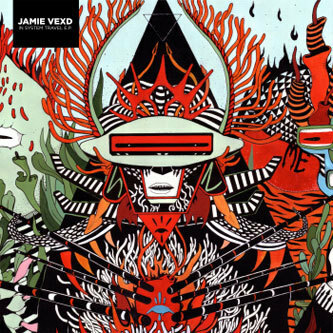 Dubstep heads, brace yerselves for the return of Jamie Vex'd. One of the brightest minds from the first wave of dubstep producers, Jamie has always stood head and shoulders above the crowd due to his application of hi-end sound design skills onto the dubstep framework resulting in stunningly spacious and perfectly proportioned productions that sound overwhelming on a decent rig. 'In System Travel' was a highlight of his ridiculously good LuckyMe mixtape, neatly sidestepping expectations with an obese soul-weighted electro-acoustic banger, which to be fair we don't hear a lot of these days! Sounding like Vladislav Delay trapped in an echo chamber with Flying Lotus and Mike Slott this is destined to blow minds on contact. 'Radiant Travel' switches up styles to a rocking sci-fi epic with tuff funk-rock breakbeats and stuka bombing synthlines, but anyone who's been following this guy will know it's all about 'Saturn'. Cutting for his own version of the Purple Wow sound exhibited by Joker and co, this is synth driven dubstep of the highest order. Mucking fassive plate. Tip!